There are two main options for your accommodations. The first option is to stay in a hotel. These will be your typical, pretty modern hotels with great amenities. Hotels in Morocco will look and feel largely like any other hotel around the world. There’s a level of predictability and comfort in choosing what is familiar. But what if you’d like to get a more authentic Moroccan experience? A one of a kind stay? Consider the alternative to staying in a hotel: a riad. A riad is a traditional Moroccan house with a garden on the inside. This inner courtyard acts as a sanctuary and respite from the outside world. Beautiful tile work, plants, and water features commonly grace this space, giving you a real feeling of peace and quiet. While these houses or palaces were originally for the wealthier of society, many have now been turned into guest houses. Rather than a large hotel, these houses are run more along the lines of bed & breakfast or boutique hotel establishments. These are incredible places to stay because they give a genuinely Moroccan experience. Riads are known for being exquisite displays of intricate Moroccan architecture. Everywhere you look, you can see the beautiful, hand laid tile work Morocco is associated with. Traditional patterns create vibrant but serene atmosphere to relax in. The hospitality and food you’ll receive will go above and beyond what you’ve experienced at hotels. Your favorite meal while in Morocco could very well be served at a riad! Open your mind and heart to what Morocco has to offer you, by hosting you in their own way: the riad way. One of the major components of most riads is the large courtyard in the center with an open ceiling. For smaller riads, you’re likely to find a fountain or two. And for the larger riads, it’s common to have a swimming pool for their guests to use. Lush trees, plants, and flowers are sure to be decorating the space as well. The garden works to create green refuge in the midst of the city. Because this center area is so lovely, the riads are built with this as the focus. Rather than windows and balconies facing the outside world, they face inwards. Windows in the rooms will open up to the courtyard instead of the streets outside. The abundance of natural light allows the whole house to be filled with sun during the day. This design has been used for two different reasons. The first originates from the Islamic value of privacy. The courtyard allows family and friends to meet, spend time together, and enjoy the delights of being outside all while having complete privacy. The second reason is more on the practical side of living in Morocco. The large courtyard-centered house allows cool air to enter the house and keep the heat to a minimum during hot Moroccan summers. In the summer months this feature makes riads comfortable even at the hottest time of day. One of the most noticeable differences between hotels and riads is their size. True to their nature of individualized attention to detail, riads are much smaller than their counterparts. Many riads even have less than 10 rooms or suites! Because there are less rooms, each room is able to be uniquely furnished. Great precision and care are put into every part of the room. Each room will have its own distinct features and personality rather than having all the same layout and décor. Picture immaculately tiled sinks and bathrooms, rich colors, and incredible artwork. The beauty of your room will amaze you with its woodwork and paintings! 3. Food: A fantastic choice for a meal, even if you aren’t staying there! Meals taken at a riad will absolutely be the meals that you remember from your time in Morocco! They are so good that even people who aren’t staying at the riad will come just for dinner! You might think that a restaurant will automatically serve better food than your accommodations but this is not the case in Morocco. Those cooking your meals at the riad are experts in what they do and love to make food that leaves guests completely satisfied. Dinners are often lavish traditional foods, a real spread of the culinary treasures Morocco has to offer. If you have special dietary needs, riads are ready and willing to accommodate you, as they are able. Let your host know what your special requests are in advance and there should be no problems finding a delicious solution. For breakfast, except a traditional breakfast that is sure to start your day off right! You’ll enjoy fresh Moroccan bread and pastries, with jam and honey. There are also accompanying breakfast foods that you would eat at a hotel’s breakfast buffet. Freshly made tea, coffee, and orange juice are the perfect thing to get you ready for another day of adventure! At the right time of year, special oranges are in season and make the best, naturally sweet juice you’ve ever tasted. You might not even know you are looking at a riad even if you are right in front of one. Remember what we said about the focus being on the inner courtyard? Because of this, a lot of importance isn’t placed on the outside entrance. Most of the doors in Morocco are wooden with carvings on them, and most riads are no exceptions. A simple door, just like all the others, can hide the most surprising and beautiful guesthouse. Many riads will only have a small sign on the street where they’re located. Don’t assume that the gorgeous riad you will stay in is easily visible from the street. The secret beauty is part of the charm. Once you step inside, you’ll understand how special this difference is. All riads are found within the old cities. The hustle and bustle of daily life surrounds these havens on the outside. In the midst of all the activity, riads offer you a step into a world away. Many tourists have appreciated this peaceful contrast after spending time exploring the busy streets. Due to the small number of rooms in the riad, service is personalized and exceptional. Guests who have stayed in the riad always comment on the detailed attention that they receive from staff! Individual needs are able to be easily met. Clients say that they felt like they knew or met every single person working there. This is another area that causes the riad to be different than the hotel and is often one of the highlights of staying in a riad. No matter what arises, the riad staff is there to make your stay worry free and as enjoyable as possible. There are a few downsides to staying in a riad. The first is that this incredible service and detailed decoration will cost you more than staying in a hotel. So, if price is the deciding factor for you, a riad might not be the way to go. If you are planning on being out exploring all day, or are looking for a place just to crash before heading to the airport, then a standard hotel would be sufficient for your needs. A riad can also be a little harder for you to find than a hotel, depending on where it is located and how clearly it is marked. After over 15 years of planning customized tours for our clients, we have gathered some of our most trusted riads for this post. Fes is the spiritual capital of Morocco and is an amazing location to see the authentic daily life of Moroccans. When traveling to Fes, check out these riads. Since Fes has the largest medina in the world, there are many more amazing riads than we can list here alone. For more ideas on where to stay while in Fes, consult one of our Morocco experts! We’d be thrilled to point you towards some of the other best riads in Fes. Dar D’or Fes: Located in safe neighborhood, this 3 star riad is the best mixture of comfort, convenience, and craftsmanship. Traditional Moroccan beauty is in every detail while the staff are committed to providing the same kind of care in the well being of their guests. Any meal at Dar D’or Fes is sure to blow you away with its taste and presentation. It’s only a short walk from the Medina’s famous Bab Boujloud or Blue Gate, shopping, restaurants, and historical sites. Riad Myra: This is a 4 star riad. Located in the center of the Medina, its location helps you explore the real Fes. The traditional blue color of Fes can be seen in Riad Myra’s beautiful design. The terrace overlooking the beautiful city of Fes is just one unforgettable highlight! Guests enjoy the luxurious variety at breakfasts while being served under the open sky. Riad Fes: This 5 star riad is perfect for those looking to experience ultimate luxury. Riad Fes includes a swimming pool, spa, delicious restaurant, and cooking classes. It’s the small details like complimentary Moroccan tea throughout the day or the ever-attentive staff that make this riad a relaxed and lavish experience. The beauty of its architecture and design is also unbelievable! Marrakech is a must-see city for every traveler that visits Morocco. Whether you are being amazed at the Great Square or enjoying the cafes, Marrakech is a wonderful destination! These riads will only serve to enhance your stay. If you are interested in other options for where to stay in Marrakech, ask us! We pride ourselves on being personally familiar with the best riads in Morocco. More of the best riads in Marrakech are only an inquiry away! Riad Boussa: Close to the famous Marrakech square Jemma El Fna, Riad Boussa is a fabulous 3 star riad that offers you a peace filled escape. Decorated in similar colors to its home city, Riad Boussa gives you a taste of the real Marrakech with the quiet your soul desires after a long day of exploring. Riad Le Clos Des Arts: The original owner of this beautiful house found meaning in using his space to host and inspire travelers and artists as they stopped through the city. Now, this 4 star riad prides itself on giving the same kind of hospitable respite to their fellow sojourners. Riad Kniza: This 5 star riad is a Traveler’s Choice on TripAdvisor. Visitors leave this riad overwhelmed by the perfection and luxury they experience during their stay. Every room is immaculate and wonderfully decorated. Visitors rave about the unparalleled friendly service and delicious food! This riad is definitely one of the best. Essaouira is the perfect beach town to visit. A city full of blue and white, its peaceful atmosphere reflects the natural beauty of the Atlantic Ocean. Don’t miss these riads in Essaouira! For more recommendations, please don’t hesitate to contact one of our knowledgeable representatives. Our firsthand knowledge of the best riads in Essaouira goes far beyond what we can fit in one blog post! Riad Mimouna: This beautiful riad is located right on the edge of the ocean, allowing visitors to enjoy the sound of waves crashing against the rocks. The restaurant serves wonderful food and the staff love to make your stay special. Due to its amazing location and gorgeous décor, this riad is a perfect 3-4 star stay. It truly is a “haven of peace”. Villa De Lo: This 5 star riad is located in the center of Essaouira, giving you amazing access to all the top sites. It boasts a beautiful view of the ocean and the port. Visitors comment on the outstanding service of the staff and the attractive old Portugese-style rooms. Personally, we have seen clients absolutely love their stays in riads, despite the price difference from hotels. Riads provide unforgettable experiences and most visitors leave only wanting to come back for another stay. Part of the charm in the riads are that they are so unique. We’d love to hear more about your travel style and preferences so that we can make customized recommendations of the best places for you to stay in Morocco. If you have any dietary or mobility restrictions, those would be helpful for us to know about as well, so that we can make sure we request the best fit for you! Due to the small number of rooms in each riad, it’s ideal to plan well in advance to secure your rooms, especially if you are looking to stay in a particular place. Be aware that spring and fall both fill up quickly, so if you are considering coming during high season, move forward with booking as soon as you are confident on your dates! 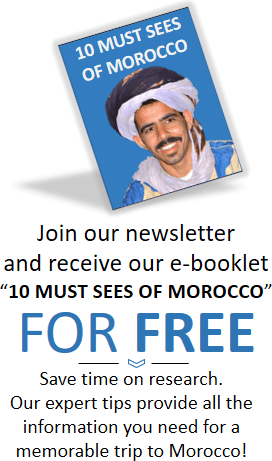 We’d love to assist you with answering any other questions you have about riads or planning a Morocco tour in general. Experience the personalized comfort and peace of a riad in Morocco for yourself!